Get the facts about the DB Recoil 29er in this full review. Mountain biking is fun, exciting and helps you stay in great shape. But shopping for a new mountain bike can be confusing, time-consuming and stressful. There are tons of mountain bikes available on the market. How do you find the perfect one for your needs? If you’re new to the world of mountain biking, reading about bike features might feel like trying learn an alien language. How do you know what type of suspension, gears, weight and so on is better than any other? Fortunately, I’ve done all the hard work for you. Whether you’re a mountain biking newbie or an experienced pro, my full review is here to help. If you’re in a hurry and just want to see the best price for the Recoil 29er, we got you covered! 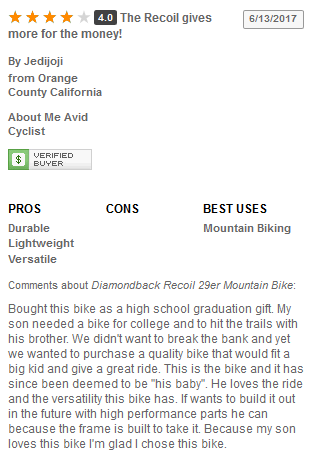 Click here to see the best price for the Diamondback Recoil 29er. 1.2 What is the Diamondback Recoil 29er? 1.5 What Is It Best For? Before providing an in-depth review, it’s important to note that there are many different options and features to weigh in a mountain bike. What’s right for you might not be right for the next rider, so you’ll want to take extra care to be sure your bike has everything you’re looking for. The basics of a mountain bike are pretty simple. But high-quality components can add up quickly. You want to find the perfect balance between great products and low costs. Fortunately, if you know what to look for, you can find a rugged, powerful mountain bike without breaking the bank. The Diamondback Recoil Trail 29er is a mountain bike for anyone interested in single-tracking off-road and rugged terrain. It’s primarily an outdoor trail rider. This is a men’s bike although there’s no reason a woman can’t use it, too – just make sure the bike is the right height. This isn’t really the best choice for people who primarily ride in the city. You’ll want a touring or road bicycle if you’ll be riding mainly on sidewalks and paved city streets. The 29er isn’t much of a racing bike, either. While you can gain some pretty good speed on the rocky trail, this isn’t a time trail or racing bike. What type of mountain bike rider are you? Do you want to ride through some hills near your house or are you an extreme biker more interested in jumps and brutal uphill climbs? Knowing the type of riding you want to do will help you decide if this bike has the features you need. Basically, this bike has overall high quality. But if you have a very specific type of biking in mind you’ll want to make sure the Recoil 29er has the exact features which will benefit you best. What is the Diamondback Recoil 29er? With an aluminum-alloy frame and SR Suntour XCT suspension fork, the Diamondback Recoil 29er is a mountain bike strong enough to handle rough, rocky trails while still providing plenty of comfort. This bike is similar to the Diamondback Overdrive Comp 29er Mountain Bike but with one very important difference. 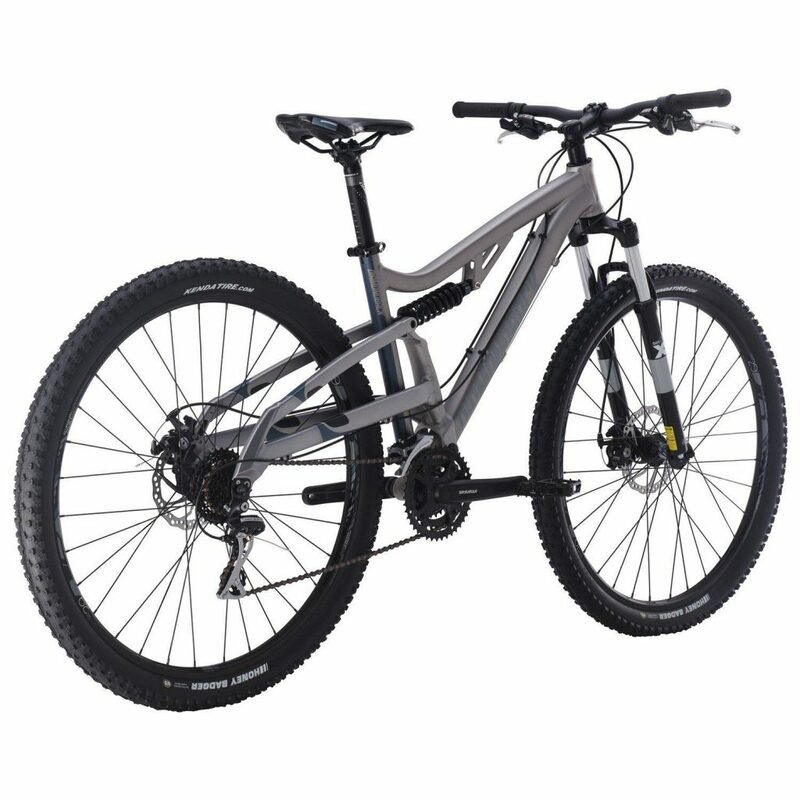 The Overdrive has a hardtail alloy frame while the Recoil is a Full Suspension Mountain Bike. Hardtails have a front suspension fork. They deliver pedaling power to the rear wheel efficiently. During rugged climbs the back wheel has more grip over obstacles and is less likely to spin out. A full suspension bike also has a fork in the front. However, the frame is made of two pieces. A front triangle and rear triangle are joined together by pivots. Each frame can move independently. The shock absorbers regulate the rate of movement. Full suspension bikes distribute power in a way where you don’t have to stand out of your seat when pedaling hard. Personally, I like the easy control of a full suspension mountain bike. Independent frame movement provides a bit more comfort in my opinion. They’re the better type of bike for bumpy downhill trails. If you like most of the features of the Recoil 29er but want a hardtail instead, I’d suggest checking out the Overdrive Comp 29er. This is a bike built to get covered in dirt. Best for dusty trails, muddy mountains, rocky terrain and other outdoor adventures. The bike is perfect for trail and cross-country riding. Depending on your skill level, the bike can handle jumping, downhill racing and all-mountain riding. 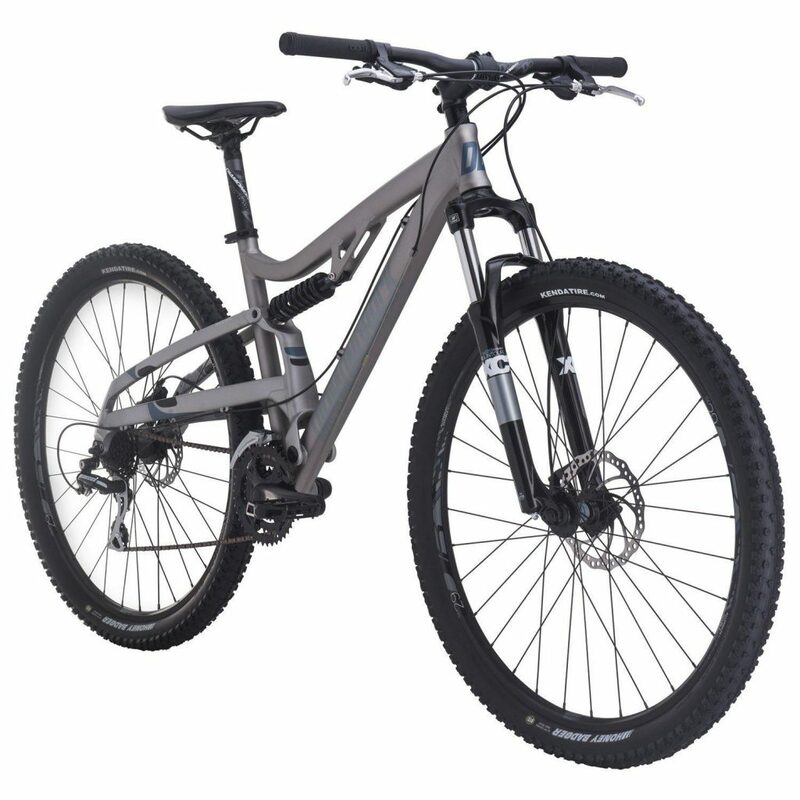 The full suspension frame makes this a good choice for fast movement on even steep inclines. With a simple, rather elegant construction this is one of the best bikes for beginners. You don’t have to be an expert in mountain bikes to be able to take this bike apart and keep it well-maintained. The DB Recoil 29er frame is sturdy and reliable. The best budget mountain bike will have a better-than-average collection of features. While you can buy the best of everything and create your own bike, you’ll save quite a bit when you can find one bike where the majority of features are already included. A bike’s frame needs to provide a solid, sturdy foundation for every other component to build from. Fortunately, the frame is one of the highlights of the Recoil 29er. The 6061 T-6 aluminum frame has a single-pivot design with 4-inches of travel. The T-6 aluminum is strong enough to handle bangs, bumps and spills on rocky trails. But don’t worry, this durability doesn’t impact weight in any major way. This bike weighs a total of about 30 pounds. I had no problem lifting the bike to attach it to my SUV. Also, you never quite know what conditions you’ll find outdoors, so being able to carry your mountain bike is a big plus. I’ve lifted this bike up to about shoulder-height a few times in order to cross small bodies of water. Is mountain biking really any fun unless you’re practically bouncing up and down the trail? I suppose that’s a question open for debate, but certainly everyone agrees in the importance of a super suspension system for absorbing big bounces. The Recoil 29er has a Suntour XCM suspension fork with 120mm of travel. A coil shock with oil dampening gives the bike four inches of travel. An external preload adjustment lets you tailor the fork to your weight and riding style. The rear shock coil is from Kindshock, which gave me a lot of confidence. I knew the rear coil was going to keep the back of the bike under my control even when passing over roots, rocks and more. When you’re tearing down a mountain trail at high speed you want brakes you can count on. The mechanical disc brakes outfitted on the Recoil 29er have all-weather stopping power. They’re Tektro Aires mechanical disc brakes which I’ve always found to be very reliable. Large wheels are a must for mountain bikes because they let you roll over obstacles without getting stuck. The Recoil 29er has, as the name suggests, 29-inch wheels. I had no problem even on very rocky terrain. Plus, you don’t sacrifice speed for size. The Recoil’s 29-inch wheels have a low rolling resistance. This makes them faster than similar bikes with 26-inch wheels, which is the industry standard. The Honey Badger 29-inch tires are just big enough to conquer the mountainside in ways smaller tires cannot. The Recoil moves smooth and fast over obstacles which would stop or slow other bikes. The bike zips along on firm terrain, too. While probably not the best choice for everyday urban living, don’t be surprised if you’re able to zip past city bikes with ease. The debate between Full System and Hardtail will never end among biking enthusiasts. There are benefits to both. The full suspension system is my preferred choice for downward slopes. I’ll also take out a full suspension bike if I’m biking a new trail. FS bikes seem more adaptable to extreme conditions on the trail in any direction. They can power up uneven terrain while also allowing for controlled descent. The Diamondback Recoil is $629.99. Personally, I found this bike to be a pretty good deal. Most bikes with similar features under $1,000 will cost much closer to $1,000 than the Recoil. One great thing about this low price is you can easily add a few gear or bike upgrades without breaking the bank. For instance, buying new shoes, adding new handlebars or breaks to the Recoil will still keep the total cost under a grand. No one bike is the best choice for everybody. Fortunately, the internet certainly has no shortage of opinions. I looked around on review sites, bike forums, subreddits and so on to see what others thought of this bike. There’s no one type of mountain bike which works best for everybody. While I really enjoy taking the Recoil 29er out for a day of all-weather mountain biking, there are some other great options available depending on your needs. Diamondback Overdrive Comp 29er: This is basically the hardtail version of the Recoil 29er. Choosing between hardtail and full suspension is pretty much a personal preference. If you’ll mainly be biking uphill over an uneven landscape, hardtail is definitely worth consideration. Diamondback Apex Elite: At first glance, the Apex Elite is very similar to the Recoil 29er. They have the same Shimano disc brakes, SR Suntour fork and more. With 27-speeds, the Apex even has more gears. But the Apex Elite is noticeably heavier. That can make a big difference if you’ll be loading the bike into a vehicle on a regular basis. 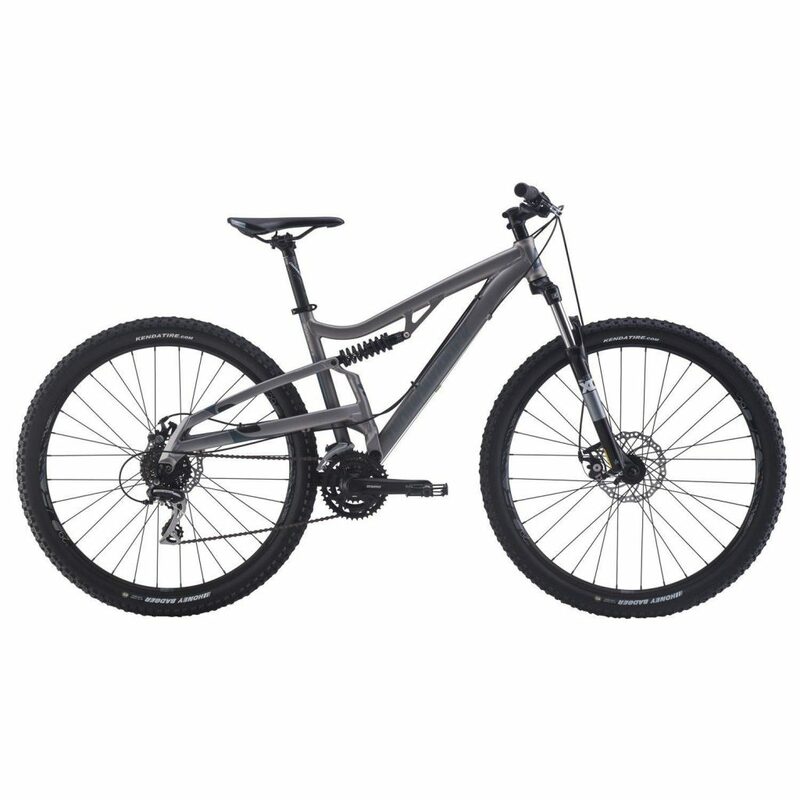 Diamondback Atroz: This is a strong, durable mountain bike which is similar to the Recoil 29er. While the Atroz is less expensive, it does have smaller wheels. The Atroz’s 27.5-inch tires are more likely to get stuck between rocks than the Recoil 29er. Still a solid choice for trail riding. The DB Recoil 29er is a fantastic trail bike for under $1000. I remember when I was first shopping around for a new mountain bike. I felt so lost when trying to compare all the options. Eventually, I learned quite a bit about bikes. Probably the most important thing I learned was that you can get a great bike for under $1,000. After conducting thorough research when writing my Diamondback Recoil 29er review, I’ve discovered this is an all-around great bike for practically any type of mountain riding. Use the bike for single trails (both blue and red), fire trails, uphill climbs, downhill races and other outdoor activities. The lightweight frame is tough but mobile. I especially love the large 29-inch tires which roll right over obstacles which would stall a smaller bike. This is a great bike if you’re new to mountain biking because you’re getting a solid package of strong individual components. Both new and veteran mountain bikers will have a blast racing up and down mountain trails on the Diamondback Recoil 29er!